After eating a wonderful salad at the Tommy Bahama restaurant, I had to buy this book. The recipes are very good, solid recipes that are fairly easy to follow. There are also lots of really nice, tropical pictures that make you want to travel to someplace tropical too! 🙂 For those of you that are fans of the restaurant, the recipes are not exactly like the entrees from the restaurant although they are similar. 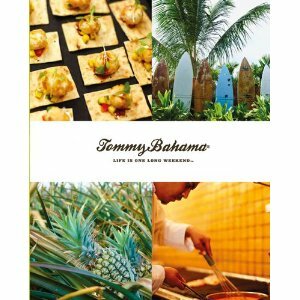 The best sections of the book, in my opinion, are the unique recipes for tropical drinks and the different sauces…they were really unique. There are lots of gems here in this cookbook! Aside from some obvious typos, I really enjoyed this book. It makes me want to go somewhere tropical!